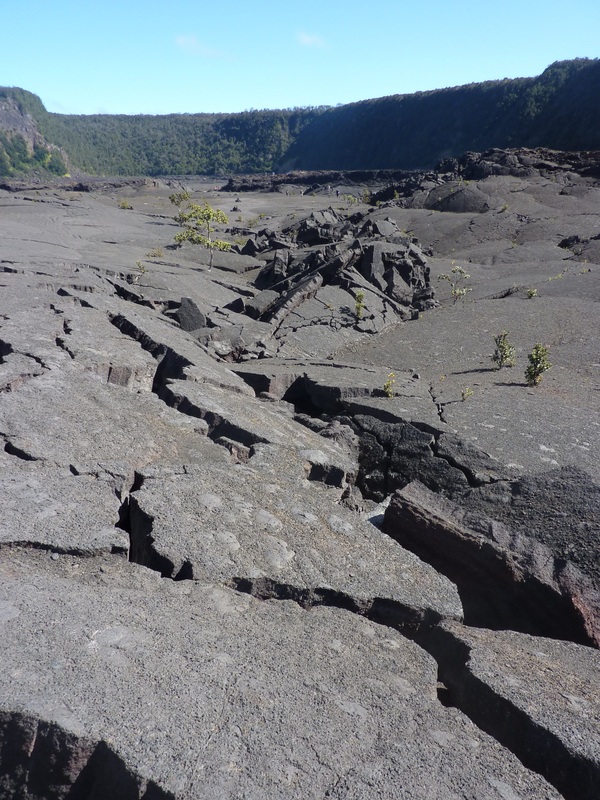 A little more aloha: On our trip to the Big Island last month, we made a day trip to Kilauea to hike the Kilauea Iki (small Kilauea) crater. This was the site of a huge 1959 eruption. All is calm now. 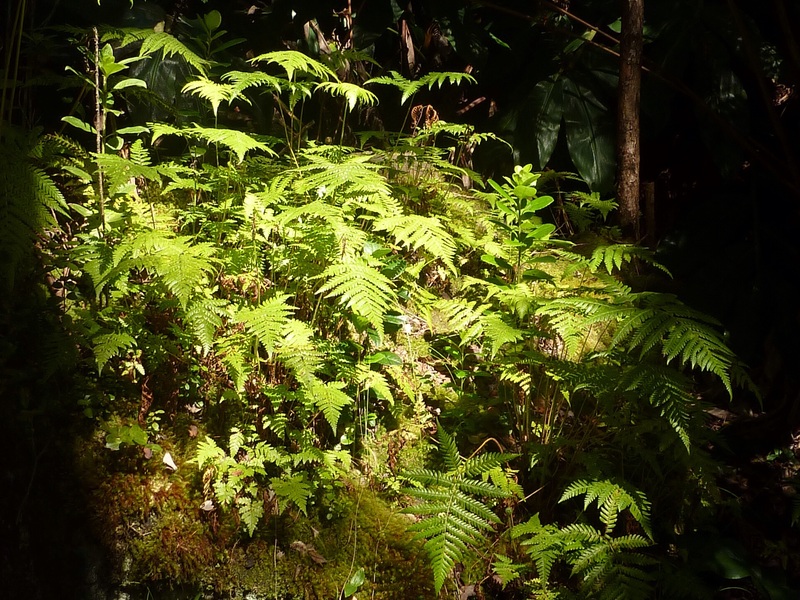 The 4 mile hike starts off at the edge of the crater, going though a beautiful forest with glimpses of the crater below. CollegeKid noted that the floor of the crater looks like “a giant brownie pan.” Why yes it does. But it’s not as smooth as it looks when you get down in the crater. These brownies are cracked! 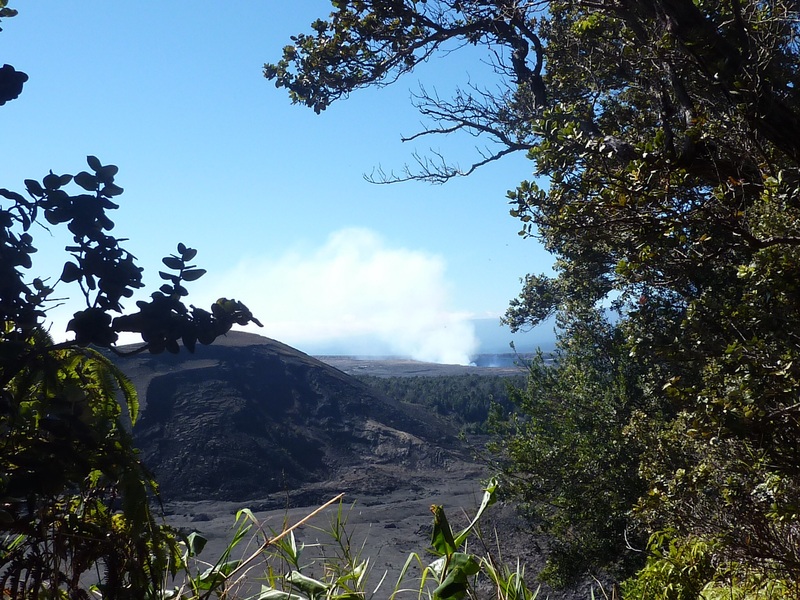 You can see the steam rising from Halema’uma’u, the crater inside the larger Kilauea caldera, on the other side of the Byron Ledge. 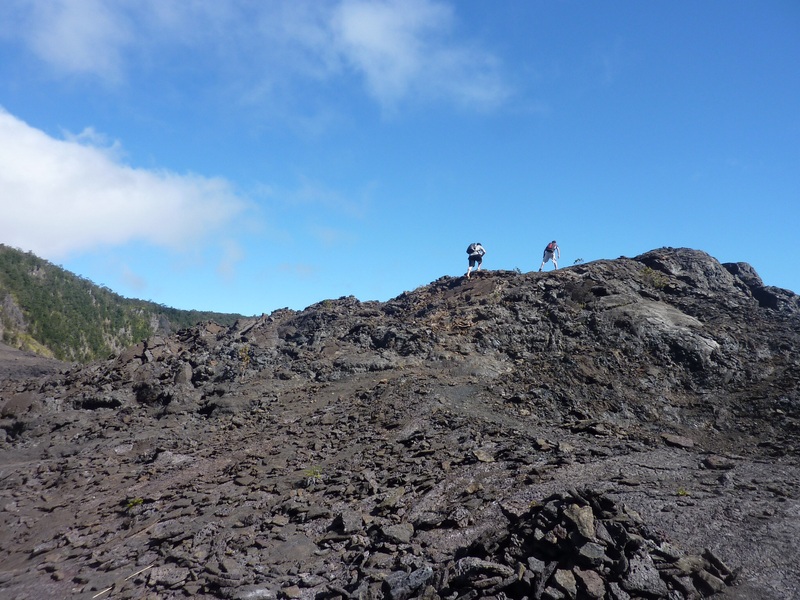 You definitely know that you’re standing on an active volcano. Science rocks! 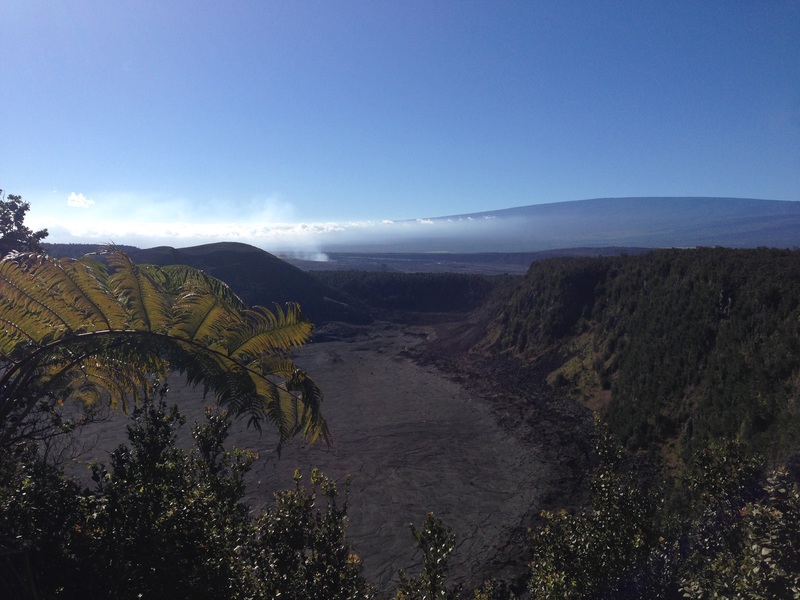 The blown out cinder cone between Kilauea Iki and the larger Kilauea caldera is Pu’u Pua’i (gushing hill). 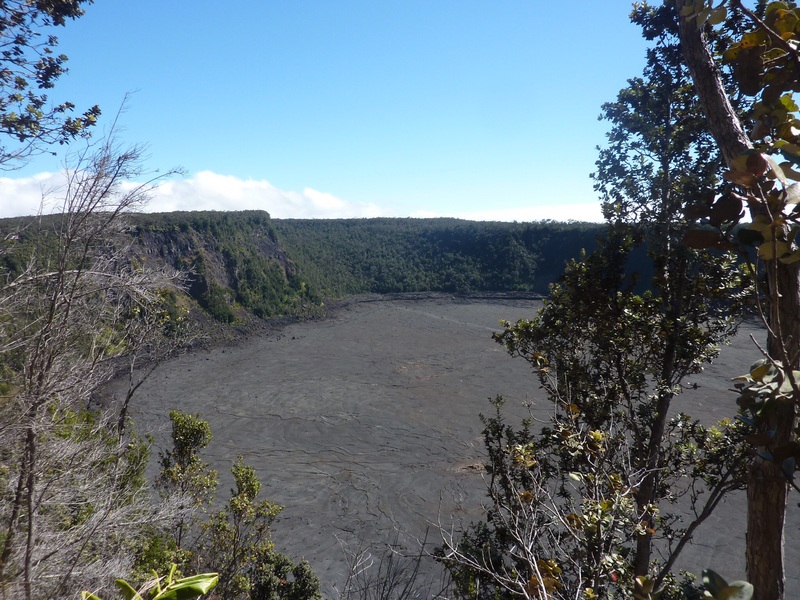 It doesn’t look that big from the edge of the crater, but when you get down into the crater, it’s a different story. The kids decided to see what it looked like up top. 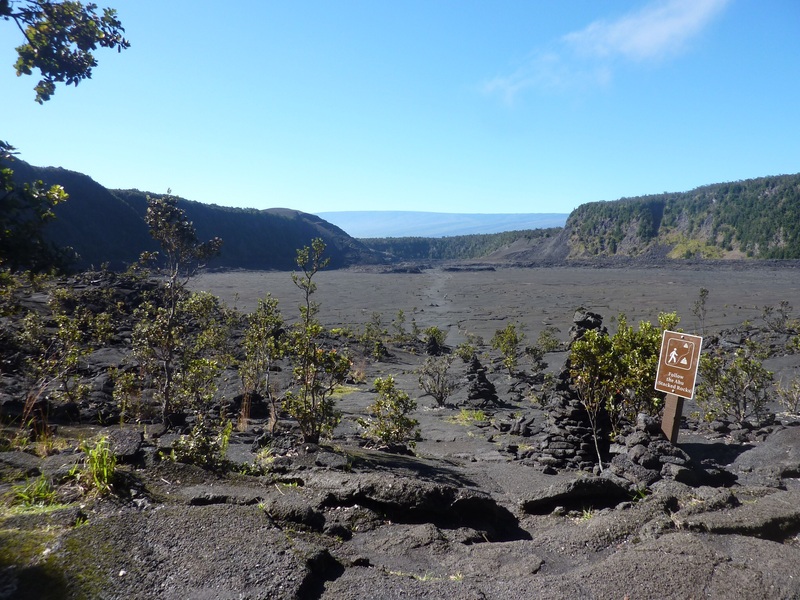 The second half of the hike crosses the crater floor. It was pretty windy the day we were there. The floor is mostly barren, but little bits of vegetation are making their way back. Steam rises from vents in the floor. After crossing the floor, there’s a climb back up to the crater’s rim. The trail is forested again, and the birds do a great job of singing but keeping out of sight. This is a great hike! I liked it even more than the one we did last year, and that was good, too. 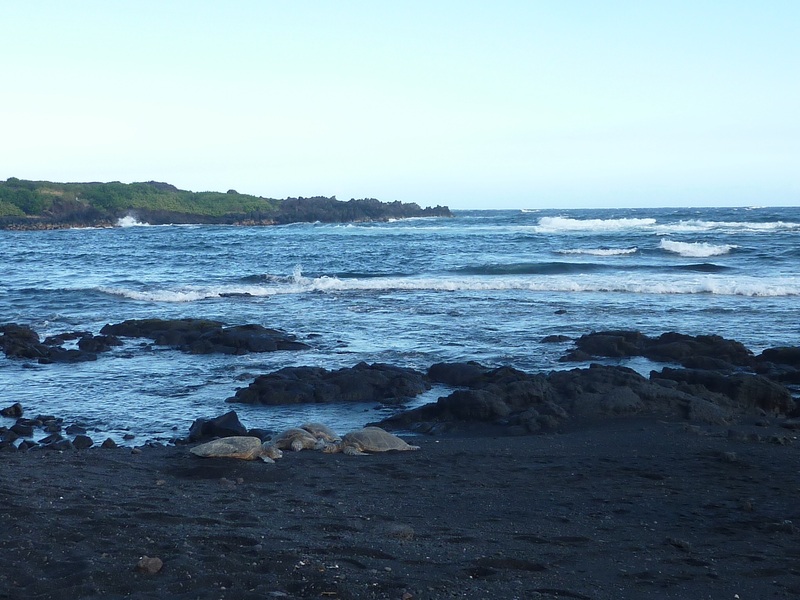 On our way back from Kilauea, we stopped at Punalu’u, a black sand beach. Yes, the volcanic sand really is black! And the water looks very blue by comparison. 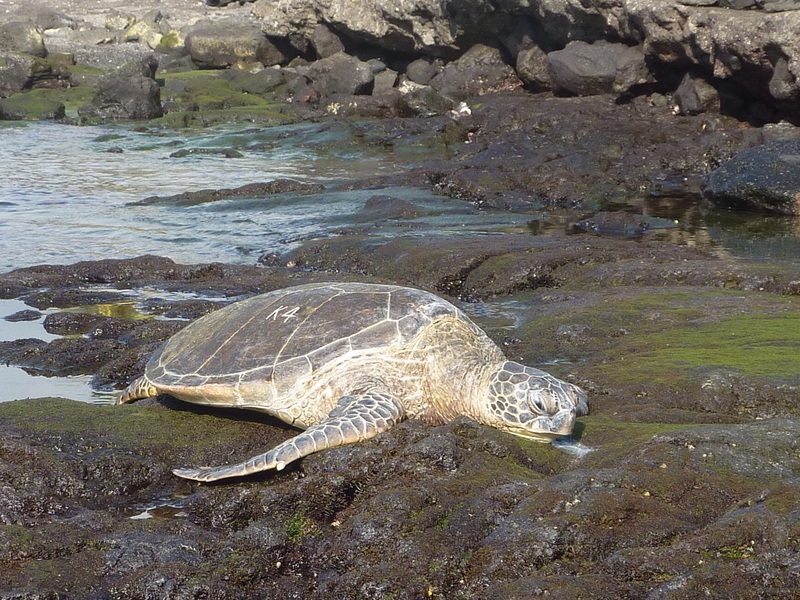 Hawaiian green turtles (honu) come hang out here. It was pretty late in the afternoon, so we didn’t stay long. 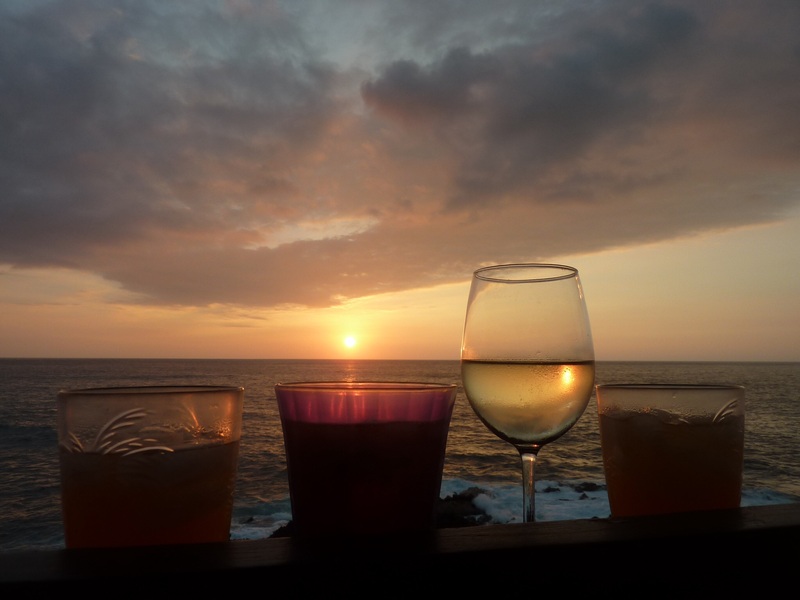 We wanted to get poké from Da Poké Shack on the way home, and watch the sunset from our lanai. We made it with 15 minutes to spare. We spent time on two other beaches on this trip. 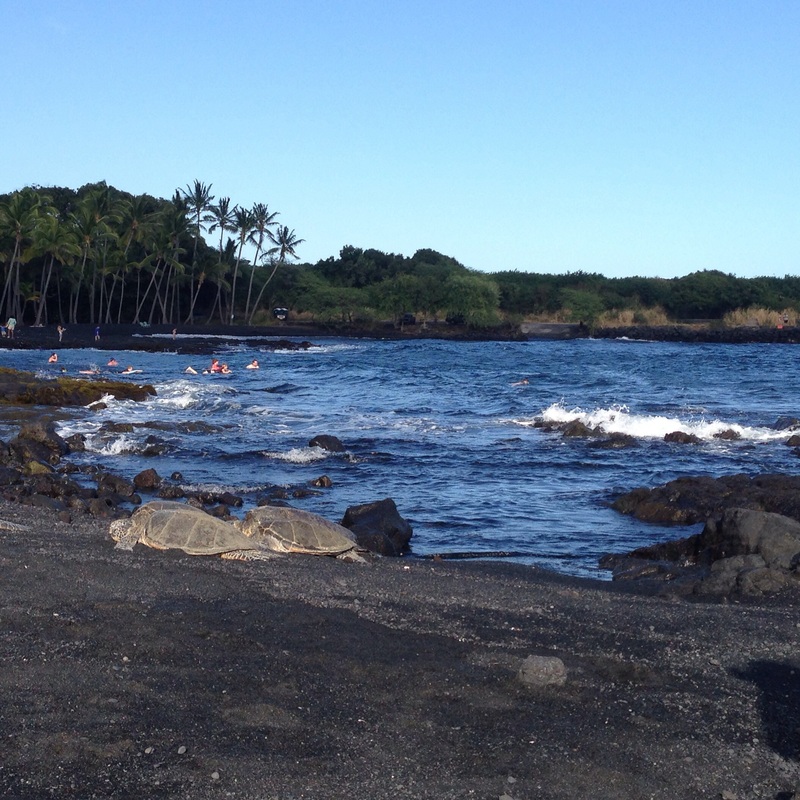 We visited Kahalu’u in Kailua-Kona, twice (second time because it beat sitting in traffic trying to go somewhere else). This is very civilized with a parking lot, concessions, and the easiest snorkeling ever. 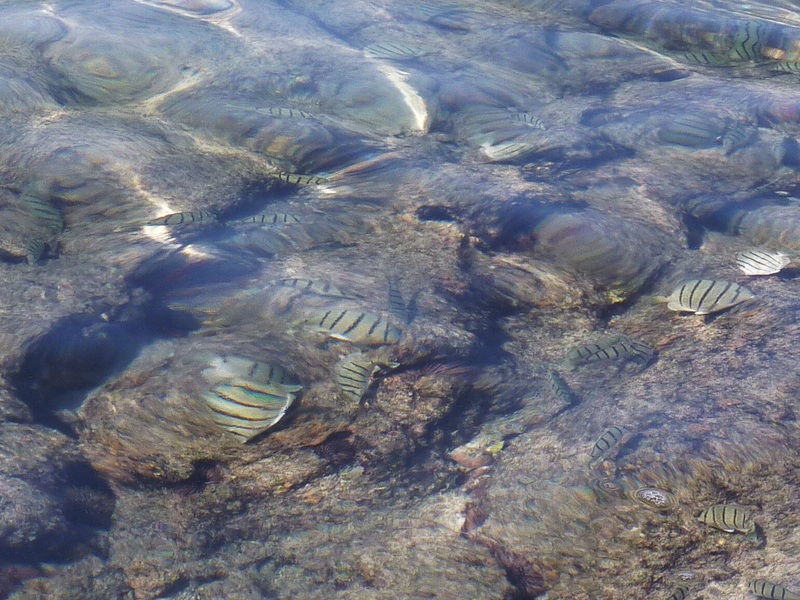 You can even just walk around on the rocks and see fish in the water, but that was so tempting that we had to get in and snorkel anyway. 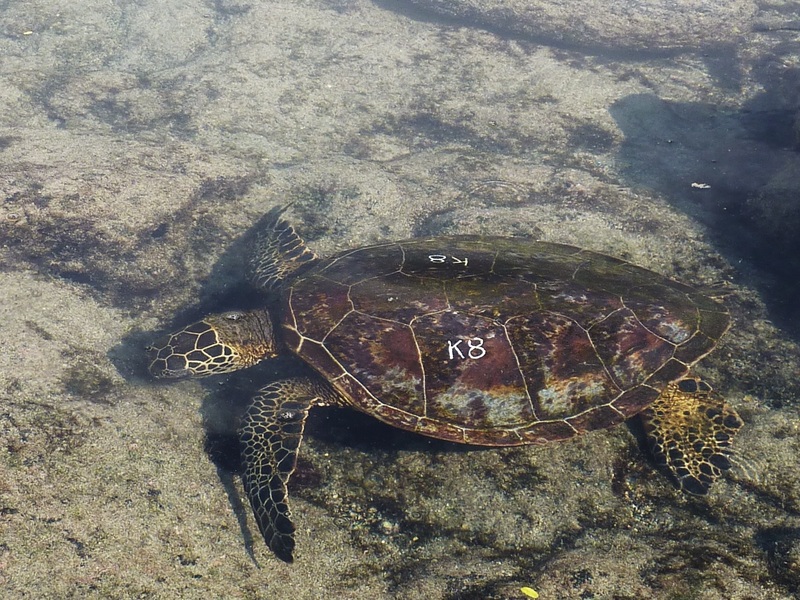 Apparently this year they’ve started numbering the honu. I’m curious if it’s always the same one up on the beach. Guess I’ll have to go back to find out. 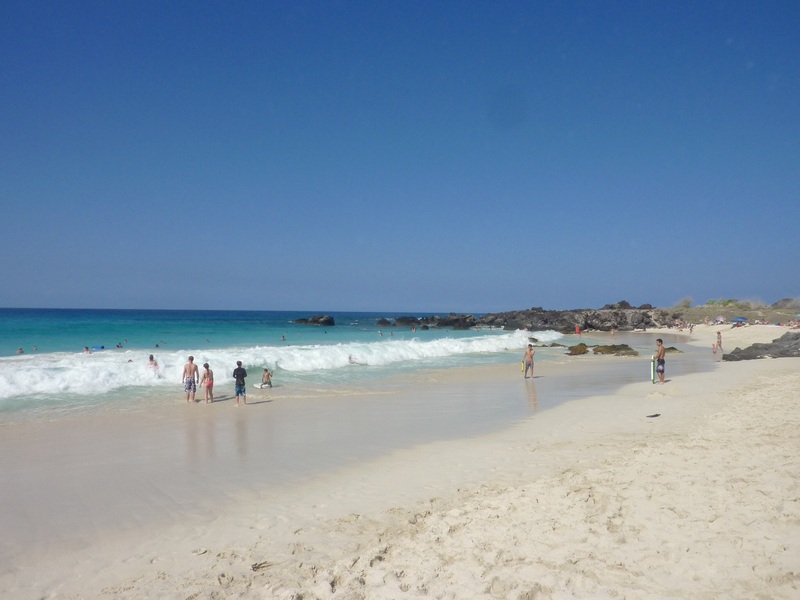 The other very fun beach is Manini’owali at Kua Bay. The water is spectacularly pretty here, as is the white sand beach. The waves are pretty strong in the winter, and the ocean pulls the sand offshore. Next month there will be a lot less beach. It all comes back in the summer. I dubbed these guys the Santa Society. There were three of them; I’m not sure how they kept their hats! We came home just before Christmas, for a whirlwind of Hanukkah and Christmas parties. I’m happy to be home, but I do miss the warm sunshine. And these guys. 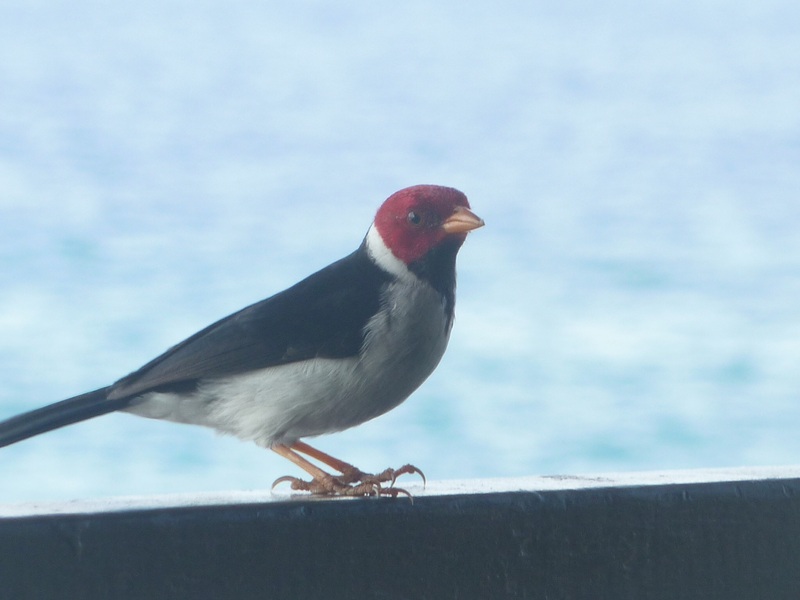 Yellow billed cardinal. They’d come after breakfast and pick up any crumbs we left on the lanai. Tidy is as tidy does! 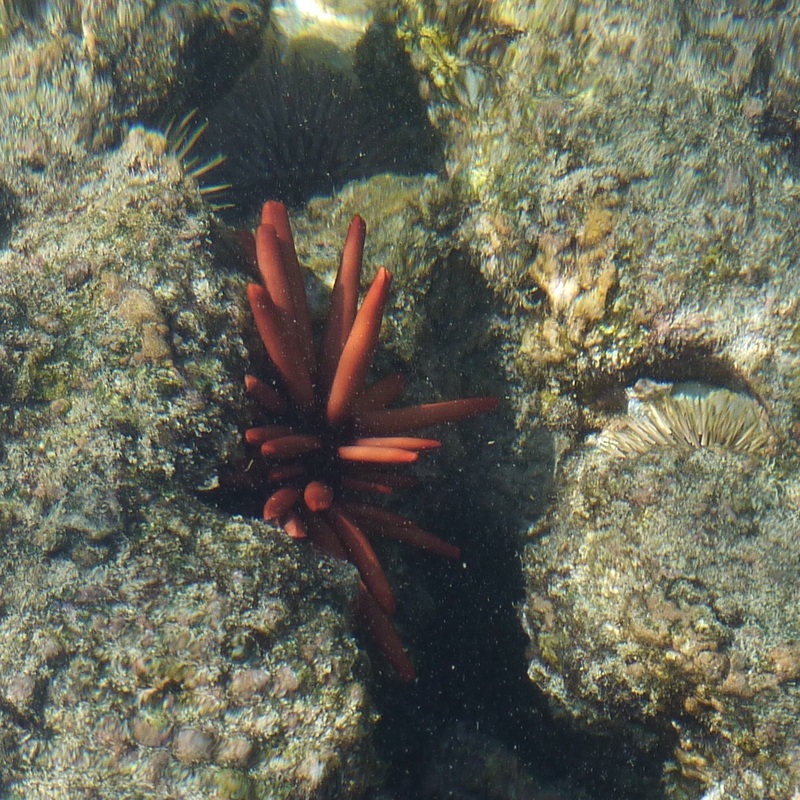 This entry was posted in Knit, travel and tagged beaches, hawaii, Hawaii Volcanoes National Park, hike, honu, kilauea, Kilauea caldera, kilauea iki, punalu'u, sea urchins, turtles, yellow biled cardinal. Bookmark the permalink. Love the honu. We went to Kahalu’u too. Great beginner snorkeling area. Last time we didn’t get to go to many other beaches as they were all closed! Too stormy and too big waves. I want to do that hike through the crater. We only looked at it from a promontory. That year I had a horrible cold and could barely function. We called it “old people touristing” as we mainly walked short distances very slowly and did no hiking at all. By the last day, I could bend over without my head exploding, so that was the day we went on a snorkel-with-the-dolphins boat trip. Spendy, but it was the most amazingly cool thing I have ever done. When we were there in December 2013, we had the same issue with beaches being closed due to big waves, but it was very fun to watch surfers from our lanai (not a usual surf area). As the week went on this last trip, the waves were getting bigger and bigger, even though there wasn’t any noticeable change in weather. Now you have to go back for the hike! This was beautiful, thanks for posting!! Thanks for reading! I love putting things like this on my blog; it makes it really easy to find later. It’s my online journal! We went to Punalu’u when we visited my parents. It’s pretty neat. 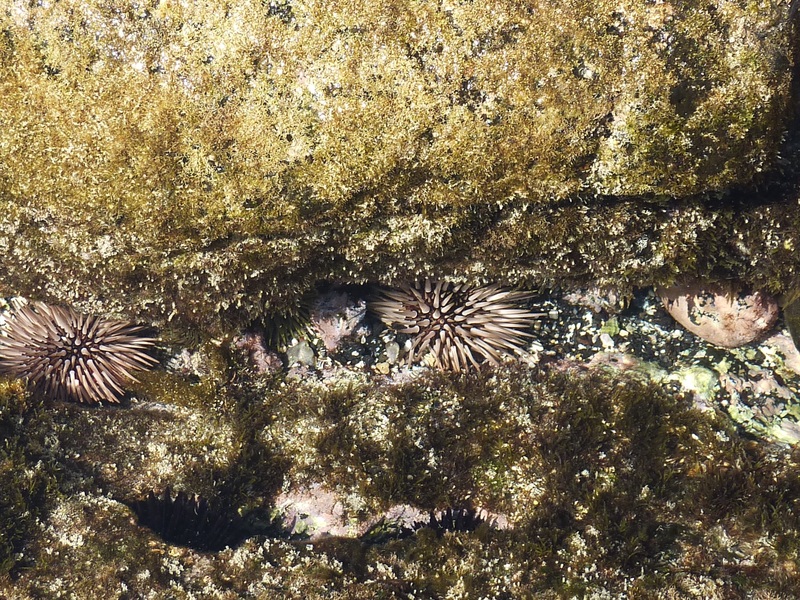 The kids enjoyed playing in the tide pools. We will have to check out the other places you mentioned the next time we go visit. Oh, cool. It was pretty late in the day when we arrived at Punalu’u, so we really just did a 30 minute look-see. We didn’t want to drive home in the dark; I’ve done that drive twice at night and it’s not fun. I hope you get to visit again soon! Great post! We loved the crater hike too. Did a lot of knitting in the car when we drove from one end of the island to the other.